You may wish to see an introductory page to this section or a page on Roman Arles first. The glory of Arles faded with that of Rome; and from the day that Honorius submitted to the dictates of the barbarian powers, this city became involved in continual disquietudes and distresses; besieged, plundered, depopulated, by every passing swarm of conquerors, it fell to ruin, commerce fled from its deserted wharfs to seek prosperity in other ports; the canals that were wont to bestow fertility upon its sunburnt plains, and to convey their rich productions to a ready sale, were left without repairs or support, and soon choaked up with sand, forming heads to numberless torpid pools, the nests of infection and disease. An excrescence, not forming part of the original structure of the amphitheatre, are the two square towers surmounting the entire edifice. 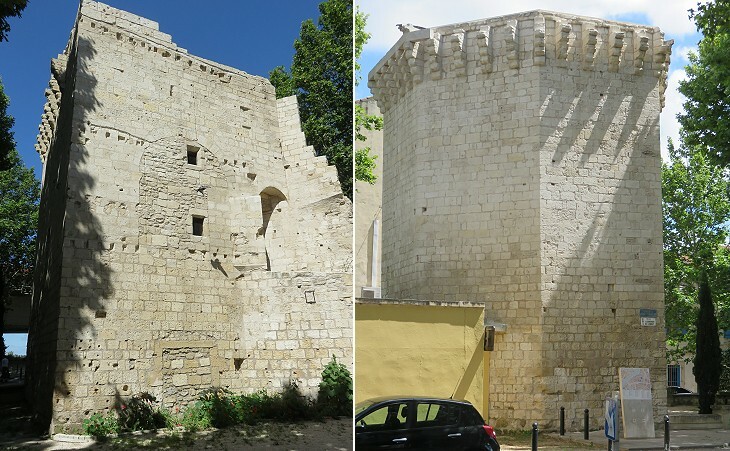 But they are interesting historical relics having been raised in the 8th century, either by the Saracens who under Jussouf Ben Aldelrahman, Wali of Narbonne, then obtained possession of Arles or by Charles Martel who expelled them from the city in 739. At all events the amphitheatre like the Coliseum of Rome was at that period converted into a fortress and withstood sieges and assaults, while 4 towers of defence were erected at the 4 cardinal points. Arles retained some importance after the fall of the Western Roman Empire, but it is only in the early XIIth that new buildings having an architectural interest were erected. Saint-Jean-de-Moustiers retains the apse of a medieval church which was decorated with channelled pillars which were designed after ancient Roman patterns. 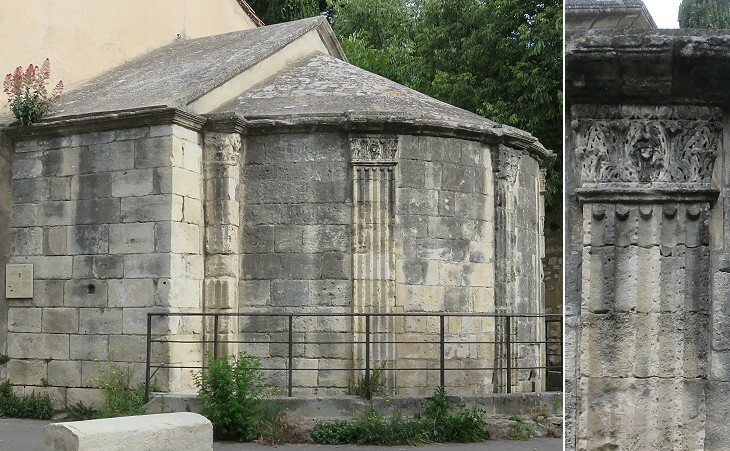 They are very similar to those of Saint-Quenin another Romanesque church at Vaison-la-Romaine. 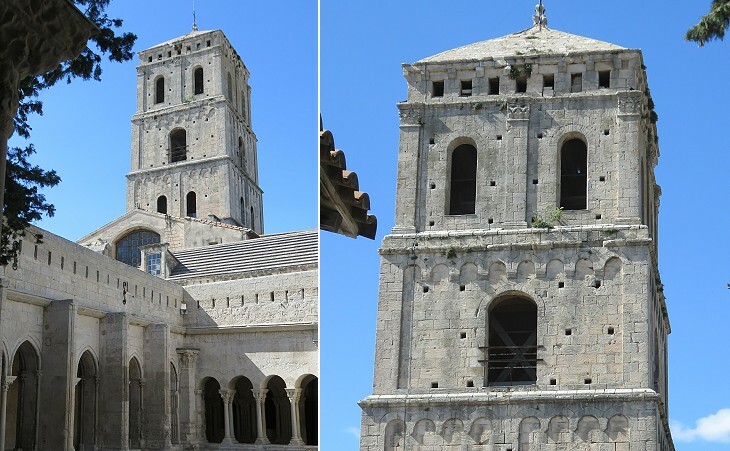 The church of S. Trophime at Arles is said was consecrated in 1152. (..) The plan is cruciform with a massive tower over the crossing, but a very poor late Gothic choir has replaced unworthily the original Romanesque apse. The style is very simple; there is little ornament in the interior, and the exterior is so hemmed in by other buildings that only the west front, and the central tower make any show. 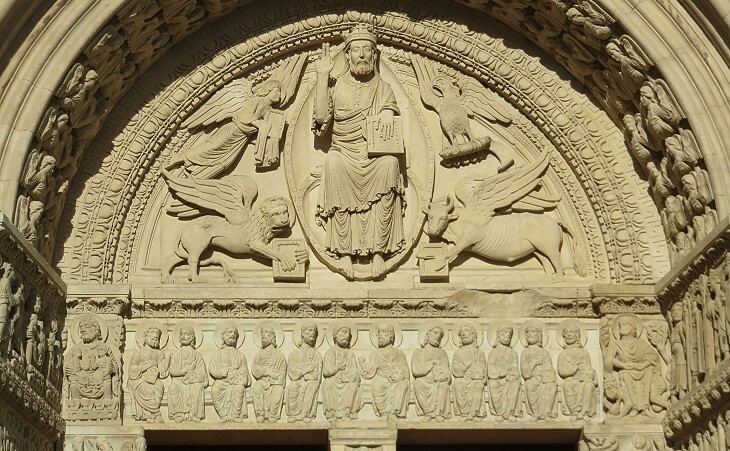 (..) The west front, otherwise plain, has the well-known portal which is one of the glories of Provencal Romanesque. Splendid as it is, ornament does not run right over the whole of the design, as it does in some later French Gothic portals, but is held well within bounds. Of the three parts into which the front is divided the lower is kept severely plain, and the upper which contains the arch has a great deal of plain wall-space and hardly any sculpture except in the tympanum. 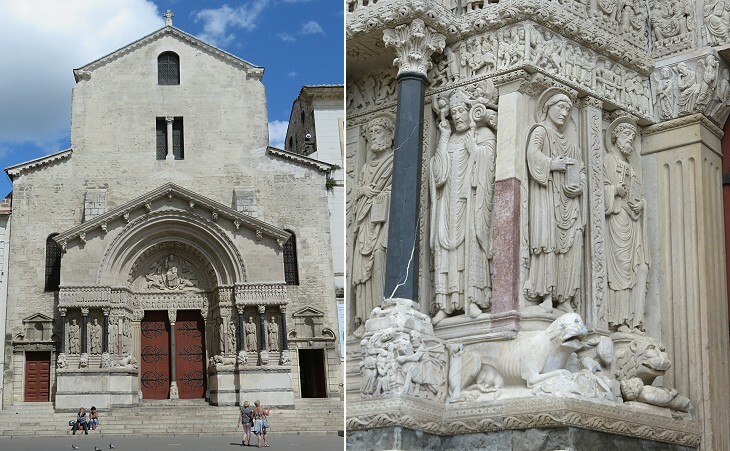 In 314 Arles was the site of a council which is considered a forerunner of that of Nicaea; in the Vth century it became an Archdiocese and in the early XIIIth century its Archbishops played a major role in the fight against the Cathar heresy. The last Archbishop died in a prison of Paris in 1792. At that time Saint-Trophime was turned into a Temple for the Cult of Reason, yet, unlike what occurred in most cathedrals of France (e.g. 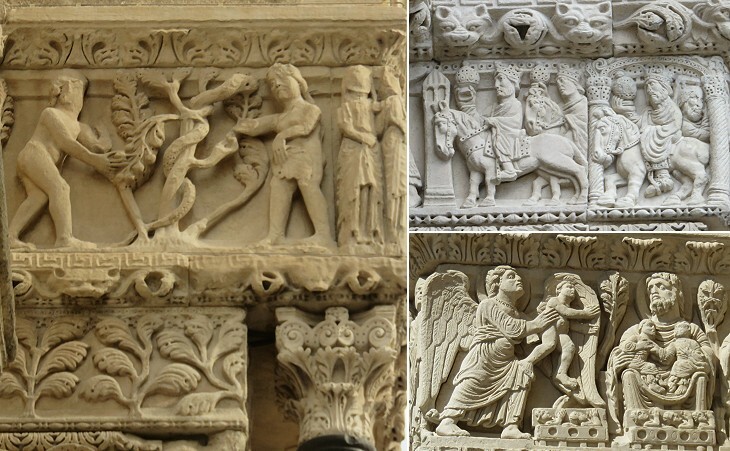 at Lyon), the statues and the reliefs of the portal were not smashed. Saint-Trophime: cloister: plate from "Alexandre de Laborde - The Monuments of France Chronologically Classified - 1816-1836"
Laborde's inclusion of this cloister and other coeval buildings among the finest monuments of France led to their preservation. He did so at a time when medieval art was despised by art historians. 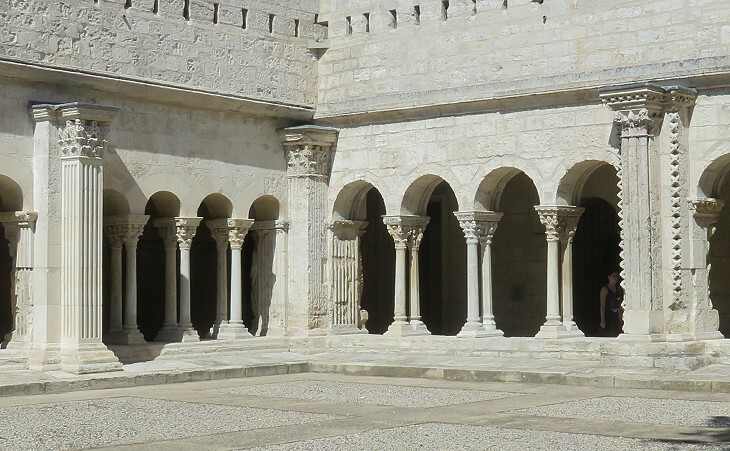 In 1846 the cloister was included in the list of French monuments warranting protection. Alyscamps, a corruption of Elysian Fields, is a vast Roman necropolis outside the walls of Arles. 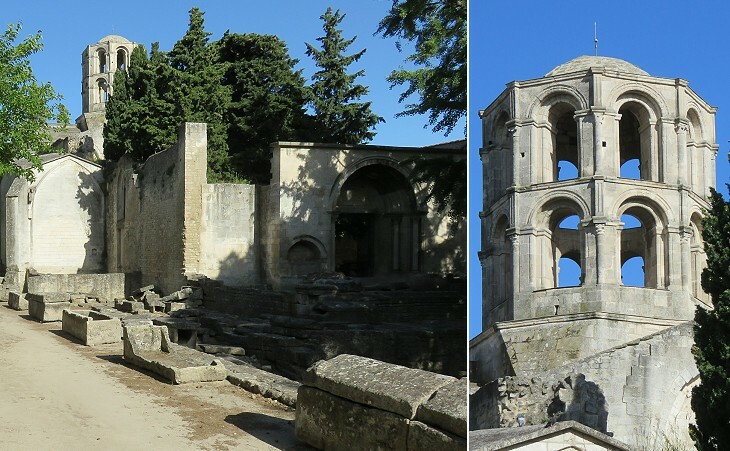 During the Middle Ages part of the site belonged to the Abbey of Saint-Césaire and a church with a Romanesque porch was built at the entrance of the necropolis. The remaining arch of the porch could be easily taken for a Roman one, were it not for some small heads of beasts which are evidence of its medieval making. 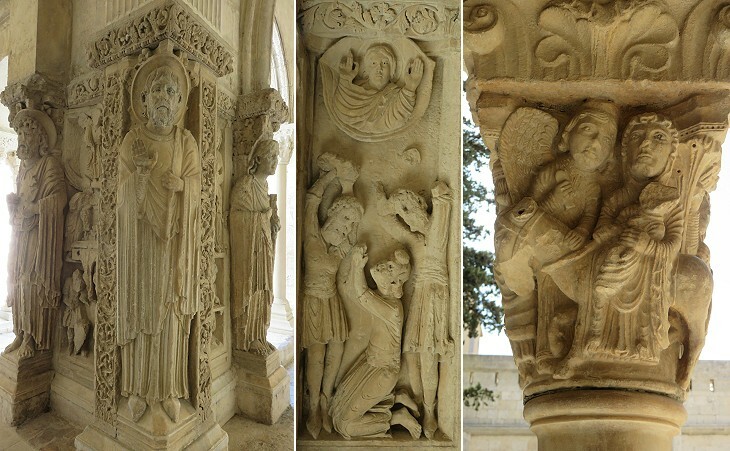 You may wish to see other Romanesque churches of Provence at Le Thor and Pernes-les-Fontaines. 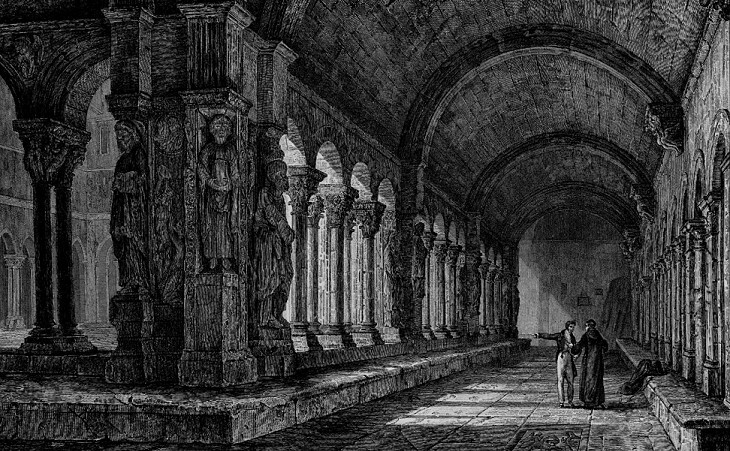 The noble families of Arles had funerary chapels inside Saint-Honorat or in detached buildings, which maybe incorporated walls of ancient mausoleums. 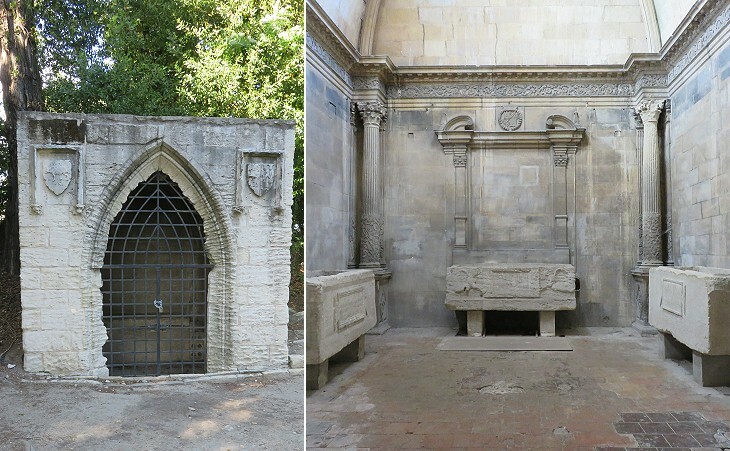 The Porcelet chapel is a rare example of clear Gothic style at Arles. 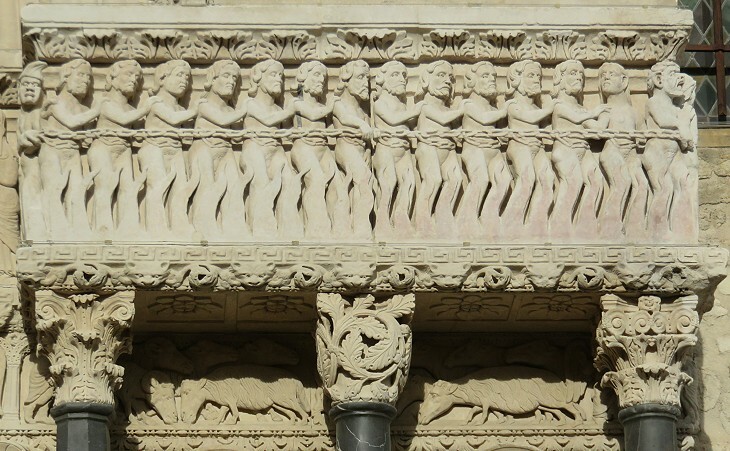 The people of Arles asserted their independence about the year 1220, and chose annual podestats to govern them. At the end of thirty years this infant and ill-established commonwealth was obliged to submit to the authority of Charles, the first earl of Provence, of the house of Anjou, too formidable an antagonist to be resisted with any reasonable hopes of success. Swinburne. The tower was built after a fight for the possession of the town between the supporters of Louis I of Anjou and those of Charles of Durazzo in 1368. Arles was part of the County of Provence until 1481 when the latter was bequeathed to the King of France. Tour des Mourgues was built approximately at the same time as Tour de l'Ecorchoir on the site of an ancient Roman round tower. 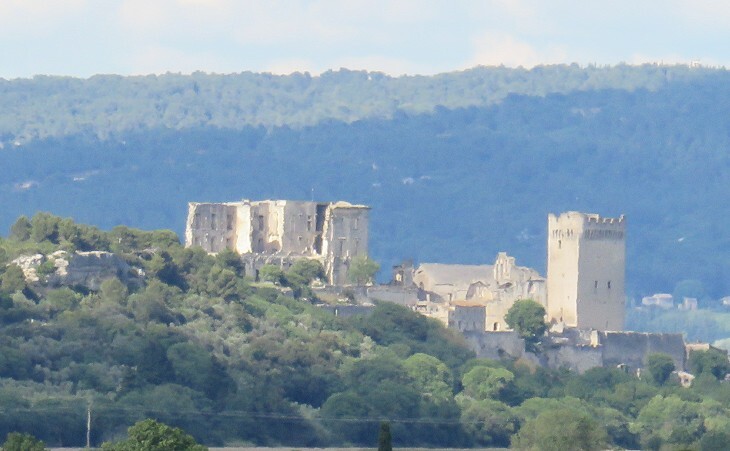 After the annexation to the Kingdom of France, Arles bore the brunt of the French Religious Wars which devastated the country in the second half of the XVIth century. In particular in 1591-1595 Arles was torn apart by a local religious conflict. 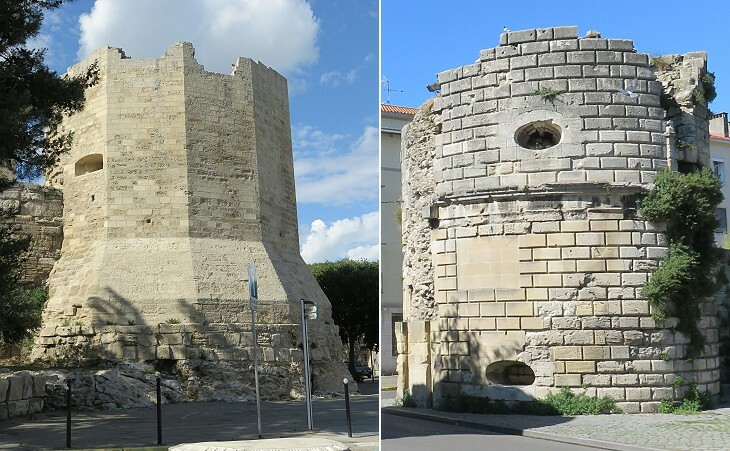 During this period a state-of-the-art section of the walls was built to protect the access to the town from Tarascon. The fortifications included a deep moat. The French clergy could rely on substantial revenues until the 1789 Revolution. Dioceses and abbeys owned large estates and in addition they were paid a special land tax, which initially was meant for the support of parish churches. 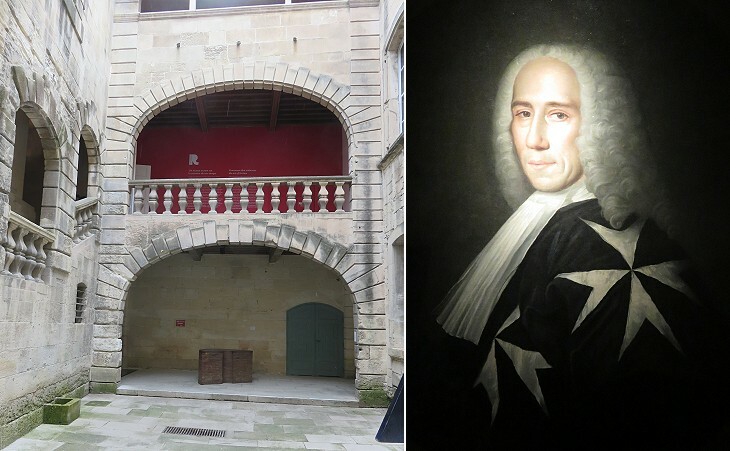 The Archdiocese of Arles was a very prestigious one and its archbishops were chosen among members of the noblest families of France who had a personal fortune. They could afford to buy expensive items to embellish their palace and the Cathedral. Provence was one of the seven Langues (Tongues) of the Order of the Knights of Rhodes (later on of Malta). 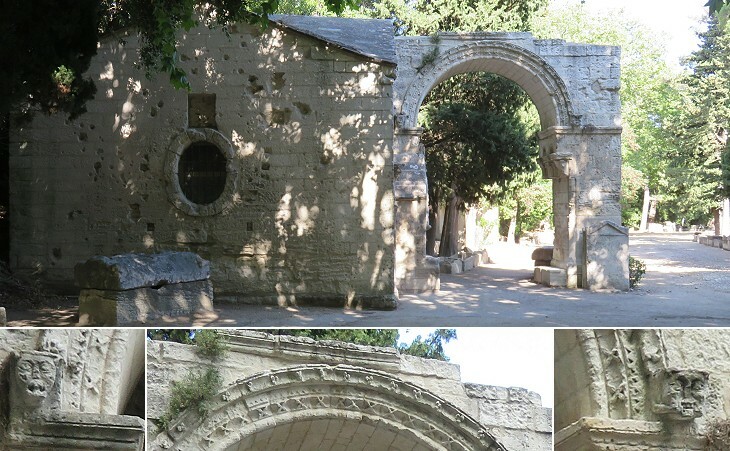 The Priory of Provence, the body in charge of the administration of the properties of the Order in Provence was located at Saint-Gilles, the port from which many Crusaders sailed for the Holy Land. 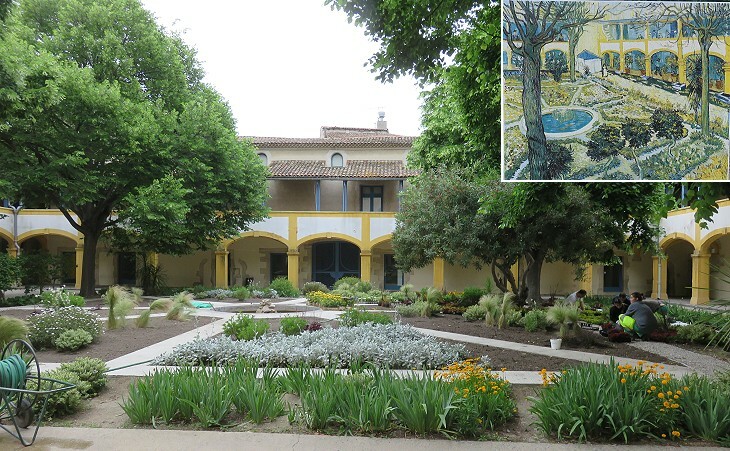 In 1621 it was moved to a newly refurbished palace of Arles. Similar to the Archbishops, the Priors came from the highest ranks of the local nobility (e.g. from the Baroncelli-Javon and the De Sade). 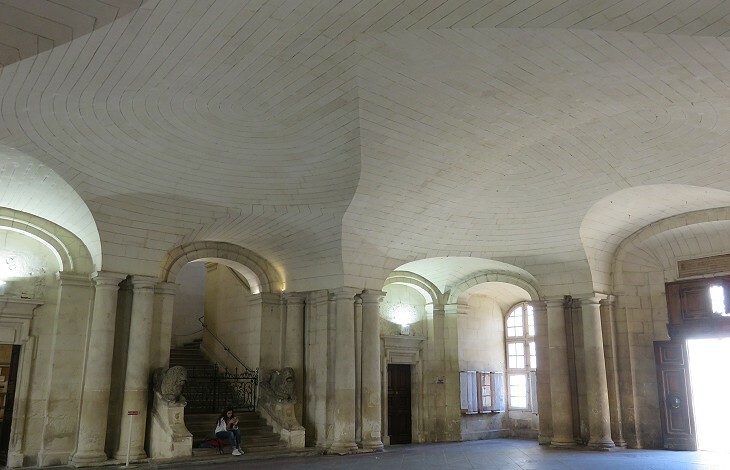 The construction of a large Town Hall in 1673-1676 was a local attempt to imitate the initiatives taken by King Louis XIV to embellish Paris and Versailles. The most peculiar feature of the building is the vault of its entrance which is not supported by pillars and columns, but uniquely by the way its stones were juxtaposed. 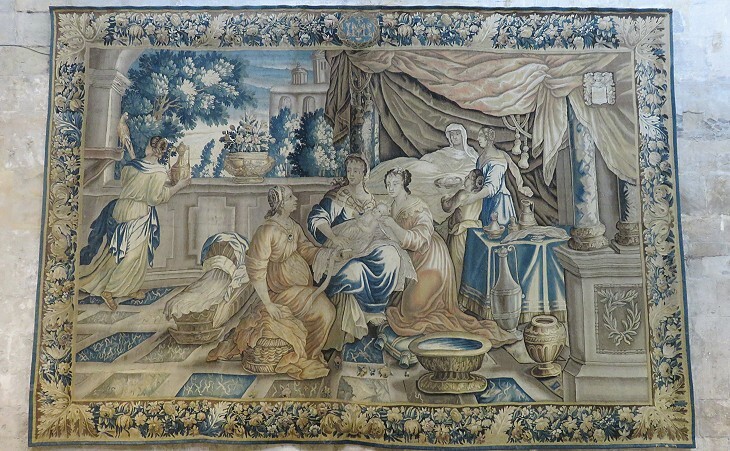 This technique was developed in France in the XVIth century and it can be noticed also in some palaces of Vieux-Lyon (e.g. in the vaults supporting the Delorme Gallery). 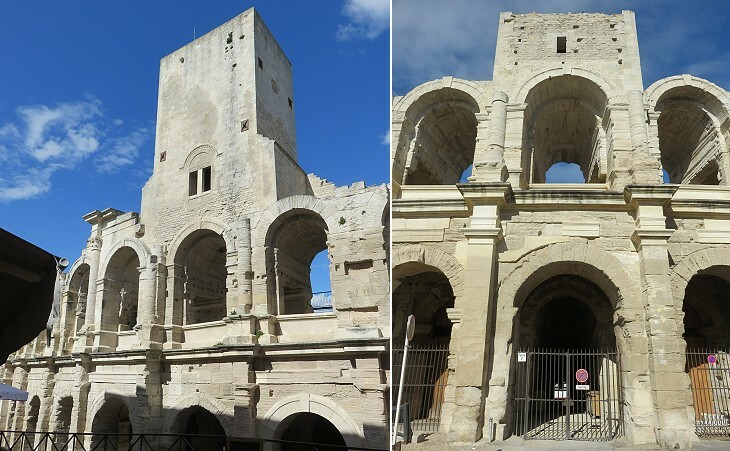 Return to Roman Arles or move to the Museum of Ancient Arles.